I picked up a pile of damaged t-shirts and jersey garments from my local op shop that were sitting in a rubbish bag waiting to be discarded, paying a small amount to take them away, and thanked the ladies for allowing me to rummage. Also scoring 3mtrs of elastic for $3.70 in the same op shop, which is needed for the skirt waistband. Using damaged clothing seems a much more sensible option, rather than cut into shirts that are otherwise perfectly wearable. Whilst I made this skirt, please do not direct all credit to me, for I used a sewing pattern and tutorial, created by pattern designer Beth, selling her designs through her site LilyGiggle.com. I made my version of a t-shirt ruffle skirt using LilyGiggle.com's Rings of Ruffle Skirt (which sells for $7.95 with instant download) pattern and tutorial. "A great way to breathe some new life into some no-longer-needed t-shirts or to make from your favorite stretch knit fabric"
Beth's PDF instructions are very easy to follow, and thorough. My Ring of Ruffle Skirt took approximately two hours to complete, and I had so much fun seeing all those ruffly colours come together. I contemplate whether one could get away with making and wearing a ruffle skirt as an adult? Having seen this, this, and this ruffle skirt, I absolutely think so! 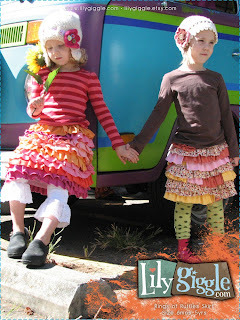 For sewing enthusiast Recycled Fashion blog readers, we have a giveaway c/o Beth @ LilyGiggle. She would like to giveaway a 3 pack bundle to one Recycled Fashion blog reader. The winner can pick any three sewing patterns /tutorials (usually $20). 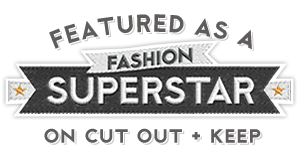 There are numerous patterns to choose from, including dresses, tops, pants, hats, and jackets. Her patterns range from 6 months to 10yrs. Each activity above counts for one entry into the competition. Please leave a separate comment below for each one of the above activities you do (for more chances to win), along with a way of contacting you. National and international readers are all welcome to participate in the competition, which closes Sunday 2nd October 2011, the winner to be drawn at random. I like the ruffle skirt, well done! It's a great way to reuse the T-shirt scraps. Done the three steps. Hope I win, the bundle will be fantastic for my projects! Saw your post on GGCA...love the skirt! new follower Please don't count my post for the giveaway of patterns... I just wanted to tell you what a great job you did on the skirt! Have a fun weekend. I'd like to partake in the Giveaway - just with a comment. I'm already a Follower and am thinking of getting rid of my facebook account. Im a grown woman with only boys but I would wear this skirt for sure! Paired with some colored tights and tall boots it would be great in the fall! This looks brilliant! Don't enter me though, I fear my sewing skills would not be up to the job. Love the skirt--nice job! I agree, I would wear it as an adult. Love the ruffled skirt - we call them ra-ra skirts in the UK :-) The adult skirt in grey tones is gorgeous! That is a great idea. I would love doing something like that for my youngest. Crazy cute! I would love this pattern for my little girl. Crazy cute! Would love this for my girlie. Crazy cute! Would love this for my little girl. Liked LilyGiggle on FB!! Left a comment!! I "liked" LillyGiggle on facebook. 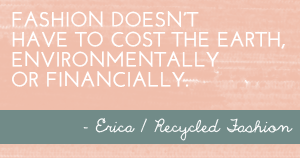 I "liked" RecycledFashion on facebook. I don't have twitter yet. eeek! great giveaway - just found your blog - I LOVE repurposing! I so would love to win this! I love her patterns! I would so love to win this! I love her patterns! Love the blues in the skirt you made too! I would so love to win this! I love her patterns! Love the way your skirt turned out as well! Following you on Twitter (@sazzyfrazzy) and retweeted this tweet (http://twitter.com/#!/FashionRecycled/status/117445167363010563) about the giveaway! I just bought the pattern. I hope to make one soon for my Daughter. If only I way slimmer - I would rock one a la Cindy Lauper. @frugal Down Under I can't wait to see your version! !